My nephew cut the tip of his finger off about 10 years ago. The fingernail bed has now grown curved around the fingertip. Hopefully yours will be better than that. Hoping your finger is better. I think I've written the same words about prints and solids at one time or another. Until I made my first quilt for QuiltCon 2013 I hadn't made an all solid quilt either. My go to is usually the big prints like Amy Butler and Kaffe. One reason why I like your quilts so much. I'm so sorry about your finger. I gave myself an unintended 'manicure' with my chef's knife once while someone distracted me. Sending you quick healing thoughts. Dearest Kelly! OUCH!!! So, so sorry to hear about this. I can't even imagine how bad that hurts! And then having to endure the ER on a Saturday night! No fun! I sure hope your finger heals and you are pain-free soon. Your minimalist quilt is BEAUTIFUL! Just so striking! Love it! Take care! Sorry to hear about your finger! I had a too close encounter with a chef's knife many years ago too - mine wasn't the tip but a nice chunk out of the side of my finger. Your experiment with minimalism is fantastic! I about fainted when I read your finger story...I totally can relate! I nearly sliced my thumb off with a utility blade last year. Not pretty and hurt like hell! For your first go around with solids...You NAILED it! This is really gorgeous! Good luck basting! Rotary cutter accident...yikes! I hope your finger heals quickly. I worry about taking off a toe. I'm notorious for leaving the blade out and one of these days I'm going to knock it into the floor. I really shouldn't be allowed to have sharp objects. Love how your experiment with minimalism is turning out. Love those rainbow colors against the dark gray background. I say it's time to recruit some help with the basting. YIKES! Darn knives...yet another reason to avoid the kitchen! LOL! Love this quilt! How was the shot cotton to work with? I've been tempted to sew with it for a while now, but for some reason it just feels different, maybe it's me? Thanks for sharing, hope you heal quickly! Yikes!! I am so sorry!! I hope the finger heals very quickly. I can't believe you actually managed to make that pretty quilt top through all that pain. Take care!! Yowza! That must have hurt! My husband is FOREVER scolding me for my knife "skills", or lack there of. I'll try to be a good girl and learn from your lesson. Do yourself a favor and be extra kind to yourself while you're healing. We tend to push things and then end up needing extra time to heal properly. I'd hate for that to happen to you. Speedy recovery!! Geesha oooh you made me cringe! I hope you heal soon-we quilters can't be kept down long though!! Oh. My. Gosh!!!! I'm so glad to hear it wasn't any worse than it was. I have had a few close calls with sharp objects and it's no laughing matter. I adore your Girl's Best Friend quilt - the shades you chose make it such a happy quilt. Oh crikey Kelly, you poor thing! What a horrible fright! I hope your finger heals well. Have you got a thimble that is comfortable to wear to protect your finger when sewing? Last month my husband sliced two fingertips with his planer. Blood everywhere. Fortunately neither was sliced right off, so he managed to fasten both flaps of skin down himself with paper stitches, and we went to get proper dressings done at the hospital two days later. The cuts are nearly fully healed already. Oh ouch! Hope the pain is starting to go away. 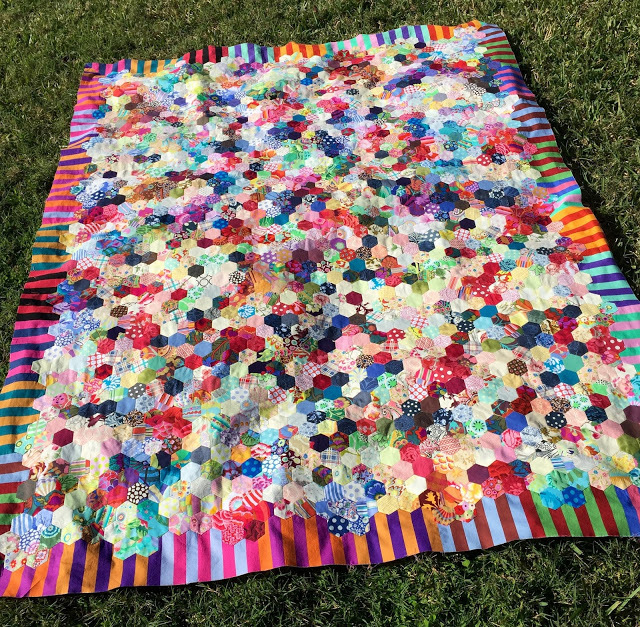 In spite of all that, you managed to make that gorgeous quilt top! The design with the solids is beautiful, and I hope you'll be writing up the pattern! Hope you're okay! I think the resulting quilt is brilliant - definitely write the pattern! I LOVE your minimalism quilt Kelly! And that block is really cool! And the modern plus and scrappy hexies are yummy too! Thanks for featuring my Janes Cross! Hope you are healing well after your trip to the ER, Yikes! 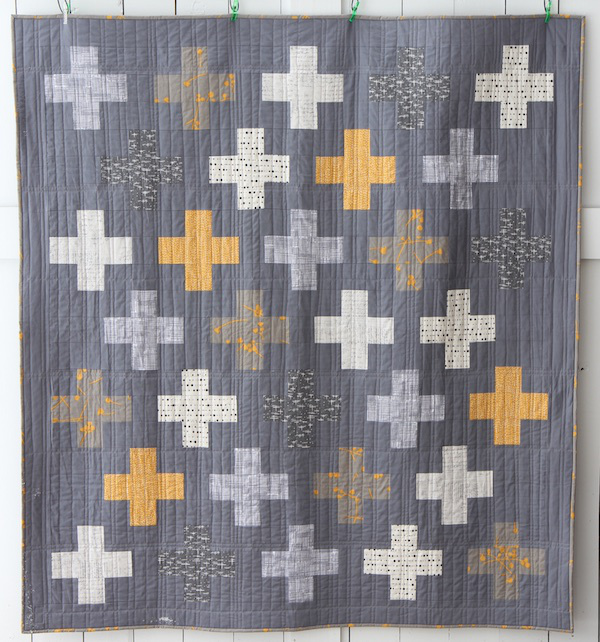 Thanks for hosting this link-up and sharing some great quilts in this post. It always makes my heart skip a beat when I see one of my quilts up here, thank you for featuring my work again! Having done this to myself twice (you'd have thought I'd have learned something the first time! ), I can truly sympathize with you. It hurts and does take a long time to heal. There's a special kind of bandage thing you can get at Walgreen's that rolls over your finger tip that protects it from water. I think it's called a finger cot and it helps. Good luck and feel better soon. You are so right. I just hope I never have to experience this again. I have some of those tube bandages and they are really a godsend. I have the waterproof kind, as well as the regular gauze kind, and they are perfect! Thank you so much! Hi Kelli, I just linked a giveaway post, let me know if giveaways aren't allowed and feel free to take it down if not. And I still love looking at your minimalism quilt. I love bright colors! Oh goodness, Kelly! I hope you're feeling better and not in too much pain. I like the rainbow solids. I've been accumulating a lot of solid colored fabrics since I, too, love the look of solid color quilts, but haven't made one yet. One of these days. Oh, I am so sorry about your finger. I hope it stops hurting soon. It's always the smallest sized injuries that hurt the worst I swear. My husband crushed the tip of his middle finger a few years back. They tried to reattach it, but it died and turned black. Eventually it fell of like a big scab. So I understand your pain and concern. The state has now marked him as "5% disabled on the middle finger of your right hand". It is so funny, but not at the same time. We are just so happy that the accident didn't hurt him more. Your quilt is wonderful! !